In the end, Osama bin Laden was not hiding in a cave. He was not living hand to mouth on the Afghanistan-Pakistan border, as many in the U.S. believed. He was, as White House counterterrorism adviser John Brennan recently put it, "hiding in plain sight" in the idyllic, affluent city of Abbottabad, Pakistan  less than a mile from a Pakistani army military academy. 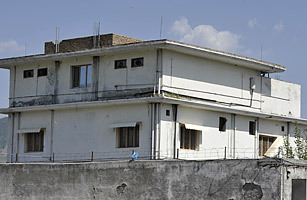 Bin Laden lived on the top two floors of a three-story house surrounded by high concrete walls  towering 10 to 18 ft. (3 to 5.5 m)  topped with barbed wire. For security reasons, his hideout did not have telephone lines or Internet. But he apparently did have a computer; Navy Seals snatched several disk drives during their 38-minute mission that ended in the al-Qaeda leader's death.